Life jackets save lives when worn. It’s as simple as that. 1. 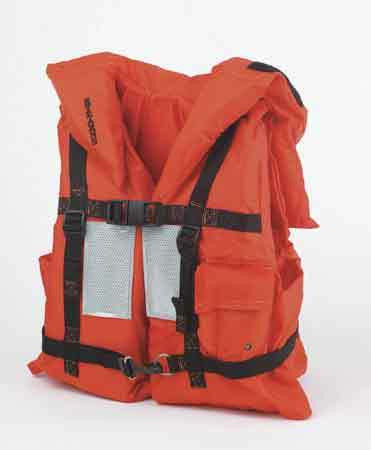 Make sure that the PFD (personal flotation device) is a U. S. Coast Guard approved and UL-Listed one. Inflatable rings and wings are no substitute and should never be used in lieu of an approved life jacket. 2. Make sure that everyone on-board has one. NO EXCEPTIONS. It doesn’t matter how good a swimmer you are, or think you are, you wear your PFD. Many drowning happen when someone is knocked unconscious or swept away by the current. Swimming isn’t going to save you, your life jacket is. 3. Make sure that the PFD is the right one for the person it’s being assigned to. Check sizes and weight. A life jacket that’s too big will slip off when needed most and one that’s too small won’t hold the wearer high enough out of the water. 4. Inspect your PFD before you leave. Check for tears, rips and deterioration of straps. Make sure the buckles work properly. Additionally, you should check your PFD for buoyancy at least once a year. 5. Do not store your PFD in an area while they will be exposed to the sun or dry them out using some kind of heat source (heater, radiator, etc…). Let them air dry. Heat and exposure to the sun can deteriorate the straps and the fabric of the PFD. 6. If your craft is over 16 feet, you also are required to have a type IV throwable device as well. Everyone loves boating, fishing, cruising along the shore, etc… but for too many people, what started out as a day of fun turned into a day of tragedy. Don’t let it happen to you and your loved ones. It seems anymore that we are told to wear eye protection for almost any and all jobs. Nothing wrong with that. I would rather be wearing eye protection even if the risk of eye injury is infinitesimaly small than not be wearing it when I need it and go through the rest of my life either blind or with only one good eye. That being said, all eye wear is not created equal and in order to be properly protected, you need to identify the hazard or risk an eye injury even if you are wearing eye protection. 1. Impact – This is probably the first one that people can identify. There are a myriad of safety glasses out there in all sizes, styles, shades and shape that are designed to protect your eyes from flying objects. Additionally, depending on the work being done, faceshields or goggles might be a better choice (if, for example, you need to protect the whole face rather than just the eyes, a faceshield would be a better option). 2. Dust – Safety glasses have been found to be extremely ineffective in protecting against eye injuries where there is dust in the air. The dust particles simply flow under, around or over the lens and find their way into your eye. Goggles are the obvious choice in this instance. 3. Chemicals – If the hazard is a chemical rather than a flying piece of debris, safety glasses are not going to be adequate. 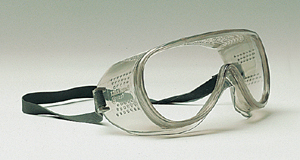 A chemical splash might result in the liquid dripping down into the eyes in spite of the fact that the glasses protected against immediate splash contact. 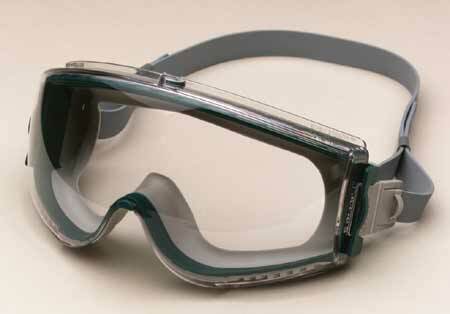 Chemical splash goggles and/or a faceshield would be the best manner of protection. 4. Heat – If the hazard is extreme temperatures, a heat shield, welding goggle or welding helmet is needed. 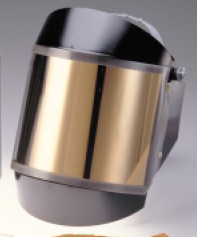 If you are using a heat shield in instances of molten metal or chemicals that may splash, you will need to double up with a heat goggle under the heat shield. Electrical arc flash is a good example of this type of application. Arc flash kits (like this one from National Safety apparel) come complete with a high heat faceshield because of the extreme temperatures generate by an arc flash. 5. Optical Radiation – Even the briefest of contacts with optical radiation or lasers can permanently damage the eye. In this instance, you will need special “laser eyewear“. Here again, not all laser eyewear is equal in protection. You will need to identify the filter type, the laser type, the wavelength, the lens color and the VLT% in order to get the correct protection factor. 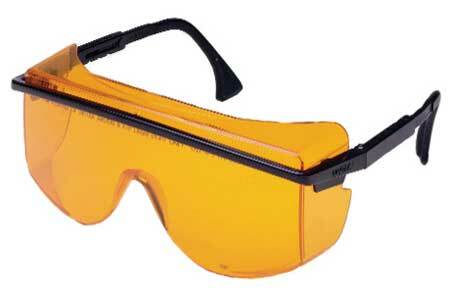 Note: if you are wearing a faceshield that can be pivoted up, as most faceshields do, OSHA requires that you wear safety glasses or googles under the faceshiel. The idea being that the hazard might occur while the faceshield is in the “up” position. Impaired driving simply means a persons ability to safely operate a motor vehicle is compromised by alcohol and other drugs that change the function of the brain and body. June 25: If you plan on drinking, designate a non-drinking driver for the evening. 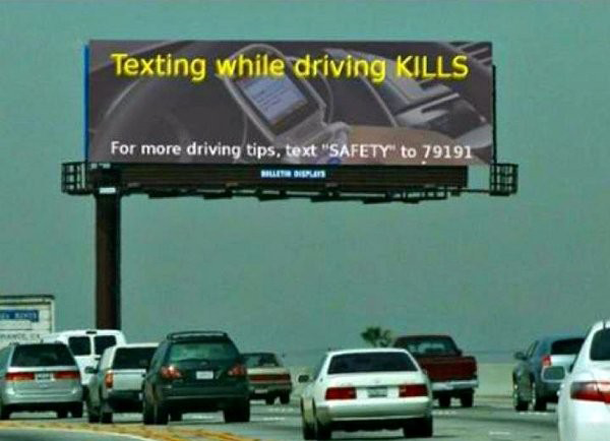 June 26: Put your cell phone on silent or out of reach to avoid the temptation of distraction while driving. June 27: Always wear your safety belt and make sure passengers are buckled up as well. June 28: Avoid aggressive driving by keeping your emotions in check and planning ahead to allow enough time for delays. June 29: Abide by speed limit signs and adjust for the driving conditions, such as inclement weather. 1. What behavior can help to avoid impaired driving? 2. What behavior signals aggressive driving? 3. Drivers who buckle up are more likely to avoid serious injuries in a crash by what percentage? 4. What type of distraction is caused when using a cell phone while driving? 5. Using a hands-free device makes driving while using a cell phone safe. Don’t tailgate: Crowding the car ahead of you makes it more likely you’ll smash into it if the driver should suddenly brake. Modern safety devices such as anti-lock brakes and traction control don’t trump physics. Obey the three second rule: Every driver should know and heed the three second rule: When the vehicle ahead of you passes a fixed object (such as a tree or telephone pole) slowly count “one thousand, two one thousand, and three one thousand.” If you reach the object before completing the count, you’re following too closely. Double your following distance (to six seconds) in poor weather. Use turn signals: Failing to signal your intentions to other motorists is always dangerous — as well as not courteous. Other motorists are not psychic; they can’t guess that you are planning on making a right turn — or about to move into the next lane. Signaling is especially important for the safety of motorcyclists, bicyclists and pedestrians, too. If they are in your blind spot and you just assume no one’s there and execute a maneuver without signaling first, these folks will get no advance warning — and will suffer the most if you strike them. Don’t impede the flow of traffic: Driving too slowly can be more dangerous than driving a little faster than the posted limit. In a high-density situation, with many others vehicles sharing the road, a dawdler creates what amounts to a rolling roadblock. Traffic snarls; motorists jockey for position — the smooth flow of cars is interrupted. Try to drive with the flow of traffic — and if the car behind you clearly wishes to go faster, the best thing to do is let it get by, whether you are “doing the limit” already or not. The other driver may have an emergency you are unaware of — and in any event, it is simply safer and more courteous to yield to faster-moving traffic. Leave enforcement of speed limits to the police. Maintain appropriate speed: Speed, as such, doesn’t kill. If it did, airliners traveling at 500 mph would have the highest accident/fatality rates of any form of transportation. But air travel is in fact much safer than driving — and few cars travel at 500 mph. The problem is inappropriate speed. For example, while it may be perfectly legal to drive 65 mph on the highway, if you don’t slow down when it’s raining heavily (or snowing) and your visibility as well as your car’s stopping ability are reduced — you increase your chances of having an accident. Similarly, if you are driving an unfamiliar road, especially a country road with many blind curves, you may not be able to negotiate the road at the same speed a local might with equal safety. Use your judgment — and adjust speed to match conditions and your comfort level. Plan ahead/use your mirrors: Anticipate the need to brake or make lane changes, etc. by constantly scanning your driving environment and watching the actions of other drivers, pedestrians and so on. This way, it’s less likely you’ll need to jam on the brakes — or make sudden steering changes — to avoid problems. The best drivers always maintain “situational awareness” — where other cars are in relation to their vehicle, what’s coming up ahead — and what’s happening on either side of them and behind them. Use your mirrors — frequently. Drive within your limits, the limits set by conditions and the limits of your vehicle: SUVs are not as equipped as sporty cars to travel safely at higher speeds — and sporty cars tend to get skittish much more readily when it snows. Older vehicles lacking modern tires or traction/stability enhancers don’t have the same built-in edge as late model cars with those features. You’ll need more time to slow down safely; the older car will also go into a skid with less provocation than a newer car equipped with an electronic stability aid. Don’t drive faster than you — or your vehicle — can drive safely, with ample “cushion” of time and space to make corrections and react to changing conditions and other motorists. 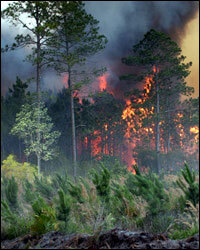 Each year, wildfires threaten people living near wild land areas or using recreational facilities in wilderness areas. Wildfire smoke can affect your health. When wildfires burn in your area, they produce smoke that may reach your community. Smoke from wildfires is a mixture of gases and fine particles from burning trees and other plant materials. Smoke can hurt your eyes, irritate your respiratory system, and worsen chronic heart and lung diseases. · People who have heart or lung diseases, like congestive heart failure, angina, chronic obstructive pulmonary disease (including emphysema), or asthma, are at higher risk from wildfire smoke. In general, people with these conditions are at higher risk of having health problems than healthy people. · Older adults are more likely to be affected by smoke. This may be due to their increased risk of heart and lung diseases. · Children are more likely to be affected by health threats from smoke. Children’s airways are still developing and they breathe more air per pound of body weight than adults. In addition, children often spend more time outdoors engaged in activity and play. What are some of the symptoms related to wildfire smoke? Eye, nose and/or throat irritation–runny eyes and/or nose. Especially following days or weeks of smoke exposure, increased short-term likelihood of getting a cold or having similar symptoms of less effective immune responses. If symptoms persist or are severe, contact your primary health care provider. · Consult local visibility guides if they are available. Some communities have monitors that measure the amount of particles that are in the air. In the western part of the United States, some states and communities provide guidelines to help people determine if there are high levels of particulates in the air by how far they can see. · Keep indoor air as clean as possible if you are advised to stay indoors. Keep windows and doors closed. Run an air conditioner if you have one, but keep the fresh-air intake closed and the filter clean to prevent outdoor smoke from getting inside. If you do not have an air conditioner and it is too warm to stay inside with the windows closed, seek shelter in a designated evacuation center or away from the affected area. · Prevent wildfires from starting. Prepare, build, maintain and extinguish campfires safely. Comply with local regulations if you plan to burn trash or debris. Check with your local fire department to be sure the weather is safe enough for burning. · Follow the advice of your doctor or other healthcare provider about medicines and about your respiratory management plan if you have asthma or another lung disease. Consider evacuating the area if you are having trouble breathing. Call for further advice if your symptoms worsen. · Do not rely on dust masks for protection. Paper “comfort” or “dust” masks commonly found at hardware stores are designed to trap large particles, such as sawdust. These masks will not protect your lungs from the small particles found in wildfire smoke. · Evacuate from the path of wildfires. Listen to the news to learn about current evacuation orders. Follow the instructions of local officials about when and where to evacuate. Take only essential items with you. Follow designated evacuation routes—others may be blocked—and expect heavy traffic. What are the known chemical components of smoke from wildfires? Particulate matter – coarse visible and fine invisible particles including soot and ash that can reach deep into the lungs and may contain irritating and cancer-causing compounds. Polynuclear aromatic hydrocarbons – a class of organic compounds found on the particulate matter from forest fires, wood stoves, and fireplaces, some of which may be carcinogenic with extended exposure. Carbon monoxide – a colorless, odorless, toxic gas produced in highest amounts from smoldering forest fires. Firefighters working near the fire are at greatest risk for high doses of carbon monoxide. Areas even a few hundred yards downwind of the fire experiencing high particulate smoke levels typically do not have high levels of carbon monoxide. Signs of high carbon monoxide levels in the blood include headaches, dizziness, nausea, and decreased mental functioning. Aldehydes – compounds that are extremely irritating to the eyes and mucous membranes of the mouth and nose. Some like formaldehyde are carcinogenic, while others like acrolein can injure lung tissue. Volatile organic compounds – strong irritants, some of which are carcinogenic. Wildfire Safety Tips – Are You Prepared? The wildfires potential is extreme in our area. 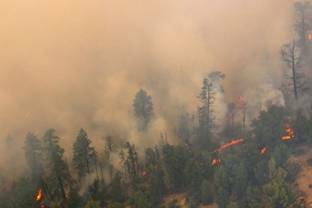 The Little Bear fire burning near Ruidoso has devastated homes, cabins and produced lots of smoke covering eastern NM. Additionally with the wind and heat there is a very real danger of wildfire. Wildfires often begin unnoticed. They spread quickly, igniting grass, brush, trees, and homes. Reduce your risk by preparing now – before wildfire strikes. Meet with your family to decide what to do and where to go if wildfires threaten your area. Follow the steps listed below to protect your family, home, and property. People start most wildfires …find out how you can promote and practice wildfire safety. Contact your local fire department, health department, Bureau of Land Management or forestry office for information on fire laws. Plan several escape routes away from your home – by car and by foot. Talk to your neighbors about wildfire safety. Plan how the neighborhood could work together after a wildfire. Make a list of your neighbors’ skills such as medical or technical. Consider how you could help neighbors who have special needs such as elderly or disabled persons. Make plans to take care of children who may be on their own if parents can’t get home. Design and landscape your home with wildfire safety in mind. Select materials and plants that can help contain fire rather than fuel it. Use fire-resistant or noncombustible materials on the roof and exterior structure of the dwelling, or treat wood or combustible material used in roofs, siding, decking, or trim with fire-retardant chemicals evaluated by a nationally recognized laboratory, such as Underwriters Laboratories (UL). Plant fire-resistant shrubs and trees. For example, hardwood trees are less flammable than pine, evergreen, eucalyptus or fir trees. Your best resource for proper planning is www.firewise.org which has outstanding information used daily by residents, property owners, fire departments, community planners, builders, public policy officials, water authorities, architects and others to assure safety from fire – it really works. Firewise workshops are offered for free all across the Nation in communities large and small and free Firewise materials can be obtained easily by anyone interested. Create a 30-foot safety zone around the house. Remove vines from the walls of the house. Move shrubs and other landscaping away from the sides of the house. Prune branches and shrubs within 15 feet of chimneys and stove pipes. Remove tree limbs within 15 feet of the ground. Thin a 15-foot space between tree crowns. Replace highly flammable vegetation such as pine, eucalyptus, junipers and fir trees with lower growing, less flammable species. Check with your local fire department or garden store for suggestions. Replace vegetation that has living or dead branches from the ground-level up (these act as ladder fuels for the approaching fire). Cut the lawn often keeping the grass at a maximum of 2 inches. Watch grass and other vegetation near the driveway, a source of ignition from automobile exhaust systems. Clear the area of leaves, brush, evergreen cones, dead limbs and fallen trees. Create a second zone at least 100 feet around the house. This zone should begin about 30 feet from the house and extend to at least 100 feet. In this zone, reduce or replace as much of the most flammable vegetation as possible. If you live on a hill, you may need to extend the zone for several hundred feet to provide the desired level of safety. Clear all combustibles within 30 feet of any structure. Stack firewood 100 feet away and uphill from any structure. Keep the gas grill and propane tank at least 15 feet from any structure. Clear an area 15 feet around the grill. Place a 1/4 inch mesh screen over the grill. Always use the grill cautiously but refrain from using it all during high risk times. Remove debris from under sun decks and porches. Any porch, balcony or overhang with exposed space underneath is fuel for an approaching fire. Overhangs ignite easily by flying embers and by the heat and fire that get trapped underneath. If vegetation is allowed to grow underneath or if the space is used for storage, the hazard is increased significantly. Clear leaves, trash and other combustible materials away from underneath sun decks and porches. Extend 1/2-inch mesh screen from all overhangs down to the ground. Enclose wooden stilts with non-combustible material such as concrete, brick, rock, stucco or metal. Use non-combustible patio furniture and covers. If you’re planning a porch or sun deck, use non-combustible or fire-resistant materials. If possible, build the structure to the ground so that there is no space underneath. Like porches and balconies, eaves trap the heat rising along the exterior siding. Enclose all eaves to reduce the hazard. Any attic vent, soffit vent, louver or other opening can allow embers and flaming debris to enter a home and ignite it. Cover all openings with 1/4 inch or smaller corrosion-resistant wire mesh. If you’re designing louvers, place them in the vertical wall rather than the soffit of the overhang. Chimneys create a hazard when embers escape through the top. To prevent this, install spark arrestors on all chimneys, stovepipes and vents for fuel-burning heaters. Use spark arrestors made of 12-gauge welded or woven wire mesh screen with openings 1/2 inch across. Ask your fire department for exact specifications. If you’re building a chimney, use non-combustible materials and make sure the top of the chimney is at least two feet higher than any obstruction within 10 feet of the chimney. Keep the chimney clean. Use fire resistant materials in the siding of your home, such as stucco, metal, brick, cement shingles, concrete and rock. You can treat wood siding with UL-approved fire retardant chemicals, but the treatment and protection are not permanent. Windows allow radiated heat to pass through and ignite combustible materials inside. The larger the pane of glass, the more vulnerable it is to fire. Dual- or triple-pane thermal glass, and fire resistant shutters or drapes, help reduce the wildfire risk. You can also install non-combustible awnings to shield windows and use shatter-resistant glazing such as tempered or wireglass. Other safety measures to consider at the time of construction or remodeling. Choose locations wisely; canyon and slope locations increase the risk of exposure to wild land fires. Use fire-resistant materials when building, renovating, or retrofitting structures. Avoid designs that include wooden decks and patios. Use non-combustible materials for the roof. The roof is especially vulnerable in a wildfire. Embers and flaming debris can travel great distances, land on your roof and start a new fire. Avoid flammable roofing materials such as wood, shake and shingle. Materials that are more fire resistant include single ply membranes, fiberglass shingles, slate, metal, clay and concrete tile. Clear gutters of leaves and debris. When wildfire threatens, you won’t have time to shop or search for supplies. Assemble a Disaster Supplies Kit with items you may need if advised to evacuate. Store these supplies in sturdy, easy-to-carry containers such as backpacks, duffle bags, or trash containers. a place outside your neighborhood in case you can’t return home. Learn first aid and CPR. Contact me for the next class March 18, 2011 or your local American Red Cross chapter for information and training. Check the roof immediately. Put out any roof fires, sparks or embers. Check the attic for hidden burning sparks. If you have a fire, get your neighbors to help fight it. The water you put into your pool or hot tub and other containers will come in handy now. If the power is out, try connecting a hose to the outlet on your water heater. Today I want to give you a gift, or more accurately, a gift to your loved ones. In a culture and time when too many of us still don’t wear the necessary PPE unless we absolutely have to, we need to be reminded that it isn’t just about our own well-being; it’s also about the trauma, financial hardship and disastrous effects that injuries and fatalities have on the ones that we love. Download it, print it and insert a photo of your family, your kids, your spouse, your significant other, your grand-kids, … and post it where you will see it while you work as a reminder that you are being safe so that you can be there for them. 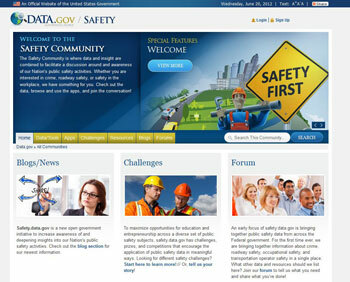 The site includes an “Apps” section where you can download mobile apps for locating a child safety seat inspection station, an app to alert you about any and all recalls, an app to provide an efficient way to view and access the safety performance of commercial motor carriers and an app designed to assist first responders on a hazardous material spill. Other apps are going to be added as they become available. There is also a tab entitled “Data/Tools” which provides a listing of date sets and tools spanning a variety of topics in public safety. Categories range from consumer safety stats and recalls to crime data and highway safety. They have a blog as well, though at the time of this post there were only two entries, the site being brand new. It is certainly a blog that you’ll want to bookmark and keep an eye on. There are tabs for “challenges”, “Resources” as well as “Forums”. With warmer weather comes more animal activity as the animal kingdom shakes off its winter coat for springtime activity. And with this activity comes the increased possibility of humans becoming exposed to Hantavirus. Hantavirus is a deadly disease transmitted by infected rodents through urine, droppings or saliva. People can contract the disease when they breathe in the virus. The deer mouse is the main culprit that carries the virus. Hantavirus pulmonary syndrome is a severe respiratory illness that can be deadly. It is caused by the Sin Nombre virus, one of a family of viruses that is found worldwide. It can be transmitted by infected rodents through urine, droppings, or saliva. Humans can contract the disease when they breathe in aerosolized virus. 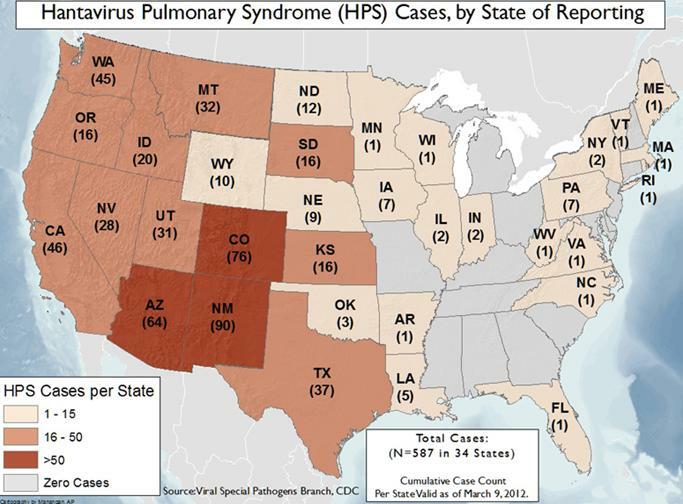 HPS was first recognized in 1993 and has since been identified throughout the United States. Although rare, HPS is potentially deadly. Rodent control in and around the home remains the primary strategy for preventing Hantavirus infection. Early symptoms include fatigue, fever and muscle aches, especially in the large muscle groups-thighs, hips, back, and sometimes shoulders. These symptoms are universal. Earache, sore throat, runny nose, and rash are very uncommon symptoms of HPS. How long after contracting the virus do symptoms appear? Due to the small number of HPS cases, the “incubation time” is not positively known. However, on the basis of limited information, it appears that symptoms may develop between 1 and 5 weeks after exposure to urine, droppings, or saliva of infected rodents. Although there is no specific treatment for Hantavirus, chances for recovery are better if medical attention is sought early. Because the virus is spread when virus-containing particles are stirred up into the air, an essential HPS prevention tactic in areas showing signs of rodents is to avoid actions that raise dust and to carefully wet the area down with disinfectant (Lysol or 10% bleach mixture). The less chance the virus has to get into the air, the less chance it will be breathed in. · Air out closed up buildings before entering. Seal up homes so mice can’t enter and trap mice until they are all gone. 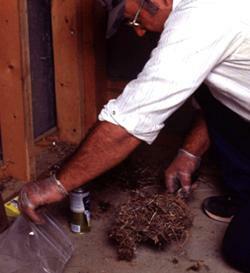 · Clean up nests and droppings using a disinfectant, and rubber gloves. Use a protective mask to minimize inhalation. Travel to wilderness locations need not be restricted but it is advisable to follow certain precautions. Try to avoid coming into contact with rodents and rodent burrows or disturbing nests. Be aware of cabins or other enclosures unless they have been thoroughly cleaned and disinfected. Chlorination: 1-2 drops of fresh household bleach (5%) per liter of water (if water is clear). If water is cloudy use 2-4 drops of bleach. Thoroughly mix the bleach and water in a clean container and allow to stand for not less than 20 minutes. If water is very cold, double the standing time. Boiling: 5 minutes should be sufficient. This is the easiest and most effective method as it kills all known pathogens. Iodination: 5 drops of iodine (2% tincture) per liter of water (if water is clear). If water is cloudy use 10 drops of iodine. Thoroughly mix in a clean container and let stand for at least 30 minutes. If water is very cold, the effectiveness of this method will decrease so let stand for an hour or more. Seal it, Trap it, Clean it! They are the best countermeasures for Hantavirus prevention. “Get Dirty. Win Big” is the theme of Dupont’s 2012 Dirty Work Photo Contest. Go to https://tyvekphotocontest.dupont.com/, upload a photo of yourself or your co-worker(s) at the end of the day with your Tyvek garment showing how dirty of a day’s work you did and you could win a prize. The contest lasts until September 30, 2012 but the sooner you upload your photo the better your chances as they are having monthly prizes. Grand Prize is $2,500.00 toward your dream vacation with runner-up prizes of $500.00 American Express Gift Cards and $50.00 American Express Gift Cards for the monthly sweepstake winner. Turns out that it could pay big to get dirty!